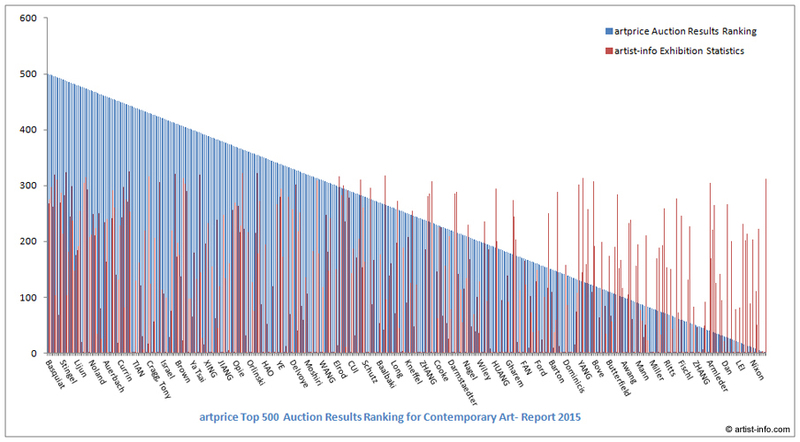 artprice.com, the auction result and sales index specialist, did publish in October 2015 its ‘Contemporary Art Market Report 2015’ together with a Top 500 artist auction results analysis. The report gives some interesting insight into the situation of contemporary art sold at auctions worldwide. Contemporary means: No Andy Warhols, Pablo Picassos, Joseph Beuys, or Robert Rauschenbergs are part of this artprice Top 500 list. As there are so many exhibitions in galleries, museums, nonprofit and collector venues worldwide we at artist-info were interested in comparing these rich and manifold activities with the artprice Top 500 list. 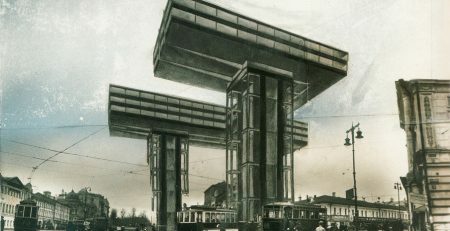 artist-info is with more than 145.500 artists and 5.580 curators in 472.100 shows (1930 – today) in 11.453 venues in 1.377 cities in 162 countries one of the most comprehensive Internet databases for exhibition histories worldwide. A — artprice Top 500 auction result report artists VERSUS these artist’s artist-info Exhibition Statistics. B — artist-info Exhibition Statistics for the artprice Top 500 artists VERSUS artprice Top 500 ranking. 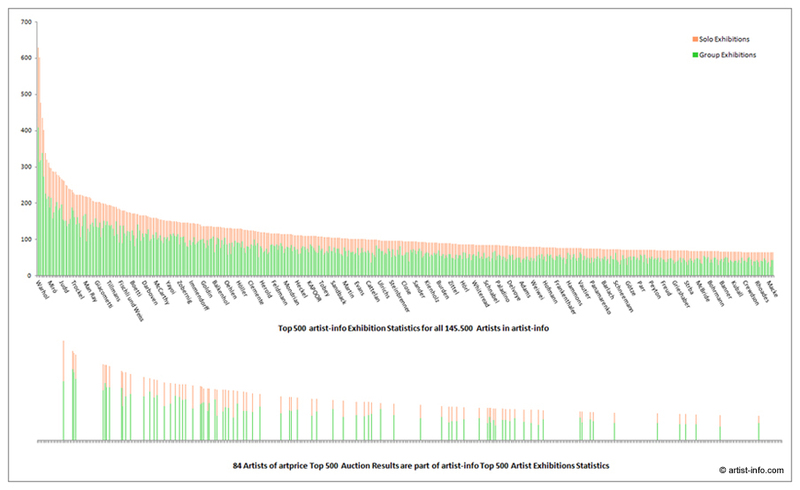 C — The ALL ARTISTS artist-info Exhibition Statistics VERSUS the 500 artists in artprice Top 500 auction result report list. The bar chart below shows for each of the 500 artists a blue artprice bar and a red artist-info bar side by side. The applied sort order for the 500 artists of artprice’s auction report list results in a blue wedge, starting with the highest rank 500 and ending at rank 1. The red bar of each artist stands for the number of exhibitions in artist-info database to which we applied as well a ranking of 500 – 1. Blue and red bars show no relation at all. We applied a 500 to 1 ranking based on the total number of exhibitions (solo- and group-exhibitions) in artist-info database to the artists in the artprice Top 500 list. Again the result is a wedge, this time of red bars. As 175 or 35% mainly Chinese artists of the artprice auction result list don’t have exhibitions documented in artist-info database the red wedge reaches the zero line much before the end. Is the market of these artists limited to auction rooms? Again no relation between an artist’s red artist-info bar and the blue artprice bar. Which position have the 500 artists of the artprice auction result report list in the overall artist-info Artist Exhibition Statistics, means Warhols, Picassos, Beuyss and Rauschenbergs included? artist-info database documents more than 145.500 artists. Our third bar chart with the 500 artists with the most exhibitions (solo- and group exhibitions) shows that only 84 or 17% of the artprice Top 500 list appear in the artist-info Exhibition Statistics Top 500 list. 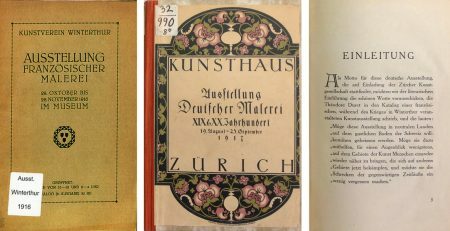 As far as we know this is the first time that an auction result report for contemporary art artists is compared with the reality of the contemporary art world, worldwide, using exhibition history documentation. Thus ‘reality’ means the artist’s public presence and appreciation in exhibitions at galleries, museums, non-profit or collector’s venues. This analysis is made possible by the artist-info database with more than 145.500 artists in 472.100 shows (1930 – today) in 11.453 venues. We were much surprised about this obvious result above. Our bar charts show two worlds apart. You would expect some relation between high number of exhibitions worldwide and an artist’s auction results total. No such relation exists. It means that everybody who buys contemporary art at an auction should compare thoroughly the artist’s analysis of auction results with the artist’s activities at galleries, museums, non-profit or collector’s venues. Weighing the later findings higher than auction result analysis means more sustainability and less risk. 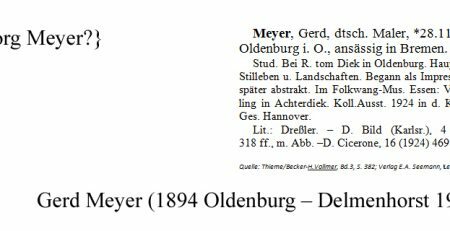 This is only one aspect of many more analysis for this auctions result report based on artist-info exhibition history documentation. 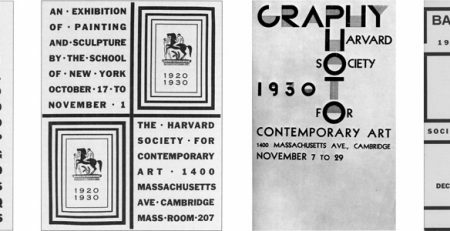 For each artist, curator, gallery, museum, non-profit and collector’s venue artist-info publishes a short analysis of their artist-info exhibition history documentation. 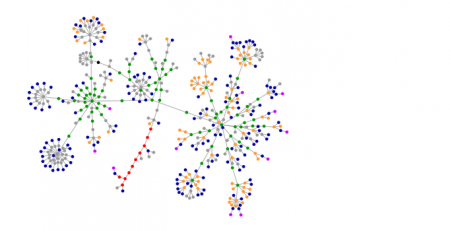 New insight and most valuable surplus is made available with artist-info‘s Visualizing Art Networks. 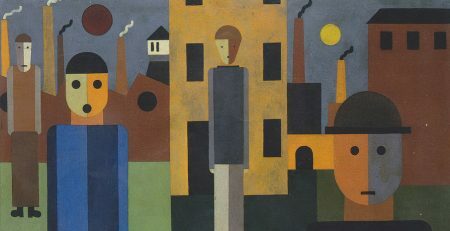 artist-info provides for buyers and all who are interested in contemporary art worldwide a most valuable source of information and with its services like Exhibition Announcements and Artwork Offers a unique place for all.